Home » How to Put DVD to HP TouchPad for Playing? How to Put DVD to HP TouchPad for Playing? I think most of you must know the HP TouchPad, because it has gained many since it was on sale with big discount last year. Only $99, you can get a tablet PC for playing games, surfing the Internet, reading e-book, and watching videos on HP TouchPad. If you are a movie lover and have many DVD discs, what would you do to kill the time when you are on the train or just on your way for a trip? Have you ever thought of watching DVD movies on HP TouchPad? Want to make full use of your 9.7 inch large multi-touch screen HP TouchPad, which features 1024*768 pixels HD resolution and a vibrant 18-bit color display? You can simply make it by ripping DVD to HP TouchPad video on Mac. Get Pavtube DVD Ripper for Mac as the best DVD to HP TouchPad Converter on Mac which provides you convert DVD movie to HP TouchPad on Mac for playing. This guide is going to show you how to convert DVD movie to HP TouchPad on Mac with this perfect DVD to HP TouchPad Converter on Mac. Then you can put DVD to HP TouchPad for playing anytime and anywhere. Step 1: Download Pavtube DVD Ripper for Mac and import DVD to it. Download and install the Pavtube DVD to HP TouchPad Converter on Mac, then click the import from DVD ROM to import DVD resource movie to the program. Tips: As the Mac computer does not have DVD drive, you need connect an external DVD drive to your Mac and then you can run the program to import. Step 2: Select an output format for DVD to HP TouchPad conversion. To rip DVD to Hp ToucPad video on Mac, you need choose a suitable output format for HP TouchPad. 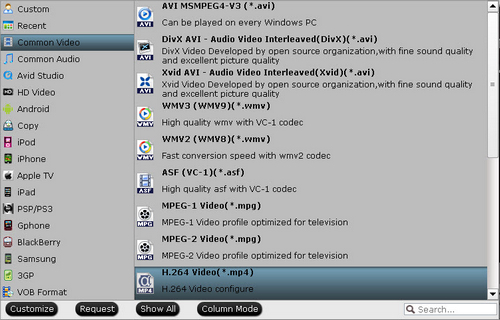 Here you are recommended to click the format bar and choose Common Video >> H.264 Video (*.mp4). Step 3: Change profile settings for HP TouchPad. The default settings are not very compatible for HP TouchPad playing, so you need to click the settings button to set video and audio parameters by yourself. Below are recommended settings. Step 4: Convert DVD to HP TouchPad MP4 video on Mac. After that, you should click the convert button and start to convert DVD to HP TouchPad MP4 video on Mac. Once the conversion finished, you can click open button to get MP4 videos. Then you can transfer the MP4 videos to HP TouchPad for enjoying.